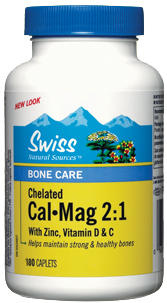 Size (inches): 2.95" X 2.95" X 5.31"
Calcium is the most abundant mineral in the body than any other. It has many functions including the maintenance and development of strong bones and teeth, keeping the heart beating regularly, alleviating insomnia, helping to metabolize the body's iron and aiding the nervous system, especially in impulse transmission. Adults: Take one caplet daily. Vitamin D - 200 I.U.